Officer Sprague was killed during a gun battle with a homicide suspect. The 39-year-old victim was a member of a posse pursuing the killer of U.S. Marshal William Story, who was shot to death the day before in Grantsville. Upon cornering the suspect in a canyon south of town, shots were exchanged and both the suspect and Officer Sprague were killed. A second posse member was wounded. Officer Sprague was married and the father of four children. He is buried in Grantsville City Cemetery. His bronze name plaque is sponsored by the Grantsville Police Department. 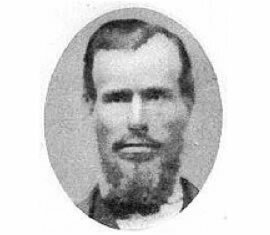 Festus Sprague was my great great grandfather. I have known for several years that he was a law enforcement officer that was shot and killed in Grantsville Utah in 1870. I always wondered what the circumstances were surrounding his death. His father,also named Festus Sprague,was a Marshal in Ohio before the family moved to Utah. I was a police officer in Idaho for 20 years. I have a grandson who wants to be an officer. It seems to run in the blood. Thank you for your information. I am glad I found your website. Officer Sprague will be honored this year, during this years annual fallen officers trail ride on April 21st, in Moab Ut. We would love for his family to attend if they could. I can be contacted at mswensen@grantsvilleut.gov for more details. This is my fifth great grandfather. I didn’t know that I had a police officer in my family line, but it makes sense because my grandmother is a very hard working, honest woman. Now I know where some of that comes from. Correction on my previous post. He is actually my fifth great uncle. His father is my direct descendant.